Inflation - What Does It Mean? What does the term "inflation" mean? What is meant by the word "inflation"? 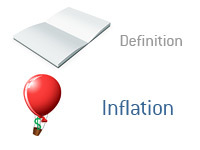 Inflation refers to the general rise in the price of goods and services. The opposite of inflation, as you can probably imagine, is deflation. Inflation results in the decreased purchasing power of a dollar (because things cost more to buy). If wages don't increase at the same rate as inflation, then people will be able to buy less and less, even if their wages do increase. For instance, if the annual rate of inflation is 3% but workers are only making an average of 2% more each year, then their paychecks won't go as far and they will be able to buy less. Economists favor a low and steady rate of inflation. The world is currently experiencing an uptick in inflation due to rising energy costs. This has an impact on nearly everything - food costs rise, transportation costs increase, etc. A sharp uptick in the money supply can cause a sharp increase in inflation, as there are more dollars floating around that are chasing goods and services. The more there is of something (for instance, dollars), the less each individual one is "worth". If the Federal Reserve, for instance, prints $2 trillion to buy US debt, then this will increase the money supply and inflation will likely soar. Governments can control inflation through interest rates. By lowering interest rates, the government increases the money supply and spurs economic activity. By increasing interest rates, the government decreases the money supply. Governments want to avoid high inflation, which is why they will increase interest rates in order to keep inflation under control.